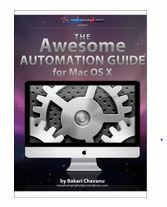 This guide will be especially useful for Mac users who work several hours per day at their computers and constantly launch applications, click menu buttons, and save, locate, rename files and folders. Are Apple’s smart automation features fairly new to you? Don’t feel in any way intimidated by what you’re about to learn. This 60+ page guide will go over these features using a clear step-by-step process, with screen shots on nearly every page. Included are practical examples that average Mac users can incorporate in their workflow. As you follow the step-by-step tutorials for creating Smart Folders, playlists, albums, mailboxes, and workflows you will quickly start producing automations to fit your particular needs.